In short, it’s a term that has a stigma. Not many people say someone is crazy and mean it as a good thing. But I, Magan Vernon, am crazy. I have the prescription to prove it. The prescription I got from a psychiatrist because I knew it was time I needed help. This is something that’s really hard to admit for anyone. Especially someone who is a semi-public figure with multiple published books and young children. I started writing Love Like Crazy in the winter of 2017. My plan was to release a Friendship, Texas book every other month. I thought with a rapid release like that, I could continuously make enough writing to support itself and keep staying home to work. That way I wouldn’t have to commute to Dallas for a job and miss things like my youngest daughter’s first field trip. It was also during that time my agent told me an editor friend of hers was looking for a series with brothers set in Ireland. I took a chance and we pitched it to the editor, who loved it and bought the series. This, of course, meant my first time with a traditional deal, more editing, and Friendship, Texas was put on hold. 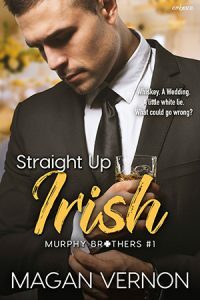 The first Murphy Brothers book (Irish brothers) did well, so I should have been ecstatic. But it was also during that time my youngest started to tell me her eye was hurting. She had always had a problem where when she drank or ate, one eye would get bigger and the other smaller. So, in the midst of trying to write some Murphy books and Love Like Crazy, I was worried about what was going on with my daughter. We went to her eye doctor who sent us to a specialist. Instead of spending my days writing, I spent a lot of days with doctor’s appointments. The specialist was where we found out she had Marcus Gunn Winking Jaw Ptosis, which wouldn’t be a big deal but with her eye alignment, she needed surgery. And this is where my anxiety and depression started to escalate. It took almost a month for insurance to approve the surgery and still weren’t going to cover all of it. I get it, it’s a no-no to talk about money, but this is honestly where my crazy started to hit. Without consistent releases, my author paychecks were low. I did try sales and advertising, yes, but when I did get paid for those months, I had to pay back my joint account with my husband for the money I spent on advertising. Taking money away from what I knew was going toward my daughter’s bills wore on me. My worries started to pour into my writing. Clay and Christy started delving into my own fears, some stayed in the book, and some ended up buried. Buried so deep that I fell into a depression that was hard to get out of. I knew I needed to finish this book. I knew I needed to be there for my children, yet I couldn’t even get off the couch. It was during this time my husband started talking about another dog and we decided to rescue one. Delving into saving a dog did help me to continue writing. We found Dallas Street Dog Advocates and met Breezy, a dog with her own crazy story who I wasn’t sure about. Literally, we met and had about 4-5 playdates before we decided this skittish dog was going to be our furever. Her story and her willingness to love again after all she’d been through was what helped me finish writing Love Like Crazy. But the nerves of getting a new dog, still paying off a surgery and being home all day with young kids and a scared dog, had my anxiety in overdrive. Something I couldn’t even put into words and use it as inspiration to write. So finally, I stopped worrying about the bills and went to a psychiatrist who prescribed me a new medication, some counseling, and gave me the “duh” moment that my depressive state had started with my daughter’s diagnosis. I was able to get my pre-orders up. To finally work again on edits and take care of a dog and my kids. Some days I juggle this all pretty well. But there are still some days that my crazy gets to me. Those are the days where people ask “don’t you have a deadline?” but I take off a few hours to cuddle on the couch with my kids and the dogs, watching a movie. I know I’m crazy. I know everything I do doesn’t make sense. 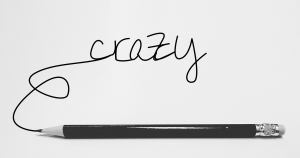 But my crazy is also a part of me. It’s a part I hate and it’s a part I also have to learn to love. « Love Like Crazy first chapter reveal!